In #1 New York Times bestselling author Jonathan Kellerman’s thrilling new blockbuster Alex Delaware and Milo Sturgis investigate the murder of a Hollywood actress pushed to the limits of sanity. Psychologist sleuth Alex Delaware is surprised to get the call when well-known TV actress Zelda Chase turns up half-naked, half-mad in the LA’s rural Westside. He has little connection to the starlet, save a psychiatric evaluation he performed on her adopted son several years ago, a child who has since vanished without a trace and whom Zelda refuses to talk about. When the actress turns up dead a few weeks later without a scratch on her, Delaware calls in police lieutenant Milo Sturgis to help him crack the case—or at least the wall of silence surrounding it. When the body of a second actress turns up with the same mysterious cause of death, Delaware and Sturgis start to wonder—is this a copycat case or a coincidence? When they uncover the death of another actress, a star from another era who vanished decades ago, never to be found, they realize they’re facing one of their most baffling, mind-bending cases yet. 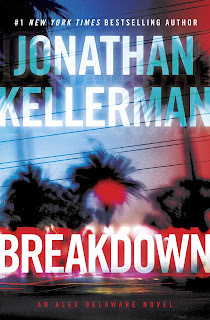 Breakdown by Jonathan Kellerman is a 2016 Ballantine Books publication. I was provided a copy of this book by the publisher and Netgalley in exchange for an honest review. It’s curious, to me at least, that as a life -long voracious reader, I have only remained loyal to a few authors or series. I have gone through stages and phases, over the years, but through all that I have always made an effort to keep up with the Alex Delaware Mystery Series. This is the thirty-first installment in this long running series, and naturally, with this sort of longevity, there have been a few stinkers in there, and I found the last couple of installments to be a little short on action and have been a little disappointed by the absence of, or the reduced face time with some of the more beloved recurring characters. Thankfully, with ‘Breakdown’, Kellerman has gotten back into the groove with one of the best novels in this series for some time. Years ago, Alex was called in to evaluate a five year old boy whose mother, Zelda, a television actress, is in the throes of a mental episode. Alex must determine if the charming boy is safe with his mother. Now, although Zelda was never his patient, Alex has been called to a very odd facility where, Zelda is being held after yet another apparent psychotic breakdown. However, her son appears to be missing and Alex is beside himself with concern. But, things really get tricky when Zelda is found dead, and a string of possibly related homicides follows. Talk about true evil! Wow, this story is an incredible tale, rich with startling details, extremely well plotted and paced, which slowly sucked me into a vivid and disturbing portrait of the darker side of humanity, which is something Kellerman is a master of. The story did start off slowly, but once we got past Alex’s outrage over the facility where Zelda was being held, the story picked up pace, in earnest. It was so nice to see Milo back working alongside Alex, something that has been missing recently. For me, Milo is almost as important to the series as Alex, and I have missed the pair riding around together, working the case equally, and of course the hilarious insight Milo offers with his jaded quips. I suppose it’s good to see Milo cutting back on refrigerator raids, but I always thought it was funny how he made himself at home with Alex and Robin, and although he plays a bigger role in this latest chapter, I still found his personality somewhat muted. As to Alex’s personal life, which has also been muted recently, and I realize Robin was never playing a huge part in the mysteries, I do like to stay updated on what she’s doing or how she is feeling about what is going on at the time. However, she does get a small chance to help out here, but for the most part she remains firmly in the background with little or no dialogue between the couple, which is a little disappointing, but this is a minor complaint, in the big scheme of things. Changes are a part of life, and so it’s only natural for a series to go through changes over time, as well, but I must say I am relieved to see things return to the formula, or style, I like most, and what I feel works the best. This story is another absorbing mystery, an incredibly frustrating guessing game, and I found it quite interesting to see Alex, who always seems capable of telling his story in a rather unflappable manner, so emotionally disturbed. His concern for this young boy, had me wanting to give Alex a big hug and comfort him. I liked seeing this vulnerable side of him, and would like to see more of this type of emotion from him from time to time. Overall, I am very satisfied and pleased with this book, and find myself looking forward to the next book in the series, more so than usual. 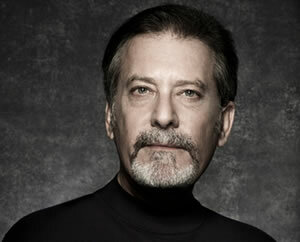 Jonathan Kellerman was born in New York City in 1949 and grew up in Los Angeles. He helped work his way through UCLA as an editorial cartoonist, columnist, editor and freelance musician. As a senior, at the age of 22, he won a Samuel Goldwyn Writing Award for fiction.